Superintendent Jerry Weast succeeded in getting the Montgomery County Board of Education to pass a resolution praising him. The Gazette calls the resolution "a pre-emptive strike of sorts for Weast." He has been trying to build support for a new four-year contract to equal or exceed his $359,000 annual compensation. The resolution passed 7-0, but board member Nancy Navarro, who has been at loggerheads with Weast, was not present, according to the Gazette. School board member Valerie Ervin (pictured), who has led a principled opposition to what many see as Superintendent Weast's abuse of power, let down her supporters Tuesday by voting for the resolution to praise the school boss - and saying she supports renewing Weast's $359,000-a-year contract. Ervin, a protege of County Council President George Leventhal, is running for County Council from District 5. A public school advocate who documented the school system's improper and possibly illegal actions to tear down a neighborhood school for a development project has chided the school board for its effusiveness toward controversial Superintendent Jerry Weast. Cyril Draffin tells the Gazette and state officials that Weast's self praise via the scripted school board resolution is inappropriate. "Many people strongly believe [Weast] has not done his job expertly, or even fairly, and there have been many flaws in his actions," says Draffin in a written communication. 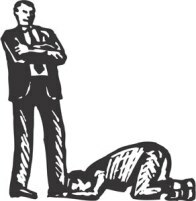 "The current board should not presume to make decisions that should be appropriately left to the new school board to make in 2007 when the superintendent’s contract is up for renewal." Draffin was one of the leaders of the successful effort to force Weast to back down from the Seven Locks/Kendale school scandal. Wacky school board member Steve Abrams is getting ugly again - this time by suing to prevent a County Council member from running for state attorney general. Abrams, a Republican candidate for state comptroller, filed suit to prevent Democrat Tom Perez from running for state attorney general. Apparently he thinks Perez is going to win. "If I'm elected comptroller, the attorney general is my lawyer," Abrams tells the Washington Times. "I want to make sure the attorney general is the one who follows the law, not the one who makes the law. It's just a quaint notion that I have." There are differences of opinion over whether Perez is legally able to run, as Maryland law dictates that an attorney general must have practiced law in the state for 10 years, and Perez only passed the Maryland bar in 2001. Perez argues he's been practicing law in the state much longer, having been a federal prosecutor who tried cases in Maryland. Outgoing Maryland Attorney General Joseph Curran, a Democrat, isued a no-surprise opinion that his fellow Democrat could run. The Maryland Bar Association says they're full of it, so Abrams sued to prevent Perez from running. Abrams certainly may have a point. Maryland state politics are so dirty that a lawsuit might be in order. But Abrams is the last person with the moral standing to make such a case, given his efforts to prevent the county Inspector General from having ANY oversight authority of the county public school system and the school board. When raised at the state level, the Attorney General gave a decision that fully pleased no one, but pointedly did repudiate Abrams' efforts to deny financial investigative authority to the Inspector General. Sort of. Like when it suits his purposes. "The lawsuit is Abrams’ latest attempt to stir the state’s political pot," says the Gazette. Maryland Governor Bob Ehrlich, like Abrams a Republican, isn't supporting Abrams, who is running against the colorfully naughty incumbent, William Donald 'Badonkadonk' Schaefer. Abrams says he's running just in case Schaefer loses the primary in September and a bad guy takes his place. Even though he probably has a point about fighting partisan cronyism in state politics, he's the wrong guy for the job. "Steve Abrams holds so many grudges," County Council President George Leventhal, a Democrat, tells the Washington Times. 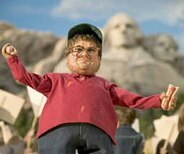 "I don't think he's got room for them in his mansion in Potomac." Montgomery County Public Schools Superintendent Jerry Weast is quietly urging the Board of Education to pass a stealth resolution intended to renew his $350,000-a-year contract - before some of his backers leave the board. Weast's tactic is intended to circumvent Maryland state law. Specifically, Weast is encouraging the lame-duck school board to endorse a resolution at its July 18 meeting that praises him and urges "continuity." The resolution would set a precedent that, in Weast's view, would pressure the to-be-elected school board to renew his contract, which expires early next year. Weast loyalists on the board would like to renew his contract now, before they leave office. But that would be illegal, so they are trying to go around the law. Under Maryland state law, school boards may not officially enter into contracts until February 1 of the year in which the contract expires. Weast's contract expires in March, 2007. So we'll be watching the school board closely to see what it does on July 18. This isn't about public service. It's all about the money - and about "Doctor" Weast's hugely inflated ego. 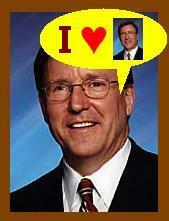 Imagine - engineering a school board resolution to heap praise on himself! Must have a self-esteem problem. Even without his $100,000-a-year tax-sheltered pension, Weast is one of the highest-paid public officials in the United States of America. Not even federal cabinet members get paid as much as Weast does. He should be ashamed of himself for scheming like this. 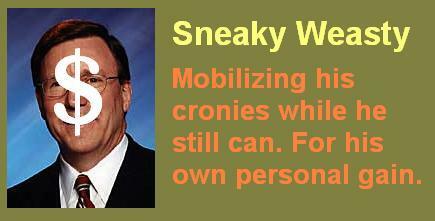 If he and his school board cronies were in it for the kids, they wouldn't need to be such sneaks. The latest state test results for Seven Locks Elementary School are astonishing! They prove again why parents fought so hard against Superintendent Weast and his school board toadies who wanted to tear down the place and merge it into a mega-campus. Weast, County Council bullyboy Michael Subin, County Executive candidate Steve Silverman and others certainly didn't have the kids' education in mind when they pushed so hard to destroy Seven Locks School. The test results empirically discredit their agenda for corraling kids into bigger and denser public elementary schools. 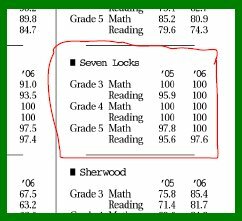 Seven Locks ranks highest in all of Montgomery County - and certainly among the very best in the entire state of Maryland - according to the Maryland School Assessments (MSA) test results for 2005 and 2006. Perhaps not coincidentally, Seven Locks is one of the smallest public elementary schools in the county. Grade 3 math - 2005: 100. 2006: 100. Grade 3 reading - 2005: 95.9. 2006: 100. Grade 4 math - 2005: 100. 2006: 100. Grade 4 reading - 2005: 100. 2006: 100. Grade 5 math - 2005: 97.8. 2006: 100. Grade 5 reading - 2005: 95.6. 2006: 97.6. The school board and school system really can't claim any of the credit. While the students, teachers, staff and parents of Seven Locks worked hard to build up such amazing achievements, Weast, Silverman and company were trying to tear the place down. All the more reason not to renew Weast's bloated contract and to keep Silverman from running the county. Subin says he wasn't invited to join women's pact . . .
Five female candidates for school board and County Council "recently formally pledged cooperation" between each elected body "on certain budget and legislative priorities." Appearing somewhat surprised, County Council Education Committee Chairman Michael Subin says he wasn't invited to join. According to the Gazette, "Subin said he has not been asked to sign the women's pact." Though not invited to join the women's group of school board and County Council candidates, Subin tells the Gazette that he's "prepared" to work with the women anyway. "I think Seven Locks ended up being the poster child for problems [between the school board and council] . . . but I don't think pacts are necessary," Subin says in the Gazette. "I'm prepared to work together without a pact in place." Word is that he's practicing to become as ladylike as possible. Supersized school board member Steve Abrams, a Republican running for state comptroller, heaped praise on Democrat Doug Duncan after the county executive quit the race for governor. "He had the good sense of following those of us getting behind [county schools Superintendent] Jerry Weast," Abrams tells the Gazette. "He’s been a very, very strong supporter of ours, both in lobbying for state resources, but more importantly, making sure county resources were available as well," Abrams said. Duncan was also the author of the Kendale/Seven Locks scandal, asking Weast to get rid of some public school property so that Duncan could turn it into a private development project. Abrams supported the deal and attacked its critics. The Montgomery County Council continues to push for the public school system to admit that it must be open to scrutiny and accountability. The Board of Education (BoE) and Superintendent Jerry Weast have tried to operate free of scrutiny, and in February formally rejected the idea that the county Inspector General have the authority to audit county public school operations. The board majority says the Inspector General interfered with school activity and cramped the school board (even though the board gladly cooperated with the IG when the audits were not aversarial). Michael E. Faden, a lawyer for the County Council, has taken up the matter with the Maryland Attorney General. "Faden argues in his letter that the inspector general's work does not interfere with school system operations or the school board's ability to do its work," according to the Washington Post. "The issue, he says, is accountability. School system operations are the single largest expenditure in the county budget, and Faden argues that the council and the public have a right to know where the money goes." Faden wrote, "MCPS is not immune from public and Council scrutiny." "As its reaction to the report may indicate, the Board of Education might prefer less outside scrutiny from the Council or anyone else. But the Board's preference does not define the larger public interest. The applicable State law should not be construed to restrict, rather than enhance, public scrutiny of large school systems' finances and operations." Photo: County Council member Steve Silverman, now running for County Executive, is trying to have it both ways. He lost his stealth plan to dig up the Seven Locks neighborhood for a pet construction project, and now that the Inspector General has come down hard on his friends, he's trying to help everyone get along. When it mattered, has opposed the Inspector General's authority over county public schools, and was a key author of a secretive campaign to privatize public school land for development projects. Indeed, he helped create the crisis that started this blog.